Get your bird dog ready and break out that blaze orange, dust off those decoys and do some scouting – we’re upland and waterfowl hunting this week. Take a brief hiatus from the big game hunting action and join the millions of bird hunters across the country pursuing pheasants, ducks, geese and more. Tune in for an upland season forecast with Jared Wiklund from Pheasants Forever. Get tips on scouting, concealment and calling from waterfowler Chad Belding of The Fowl Life on Outdoor Channel. And don’t miss John Gechter with Rainin’ Skies Waterfowl in Denver, Colorado as he discusses locating birds, building an effective decoy spread and becoming a better shooter. 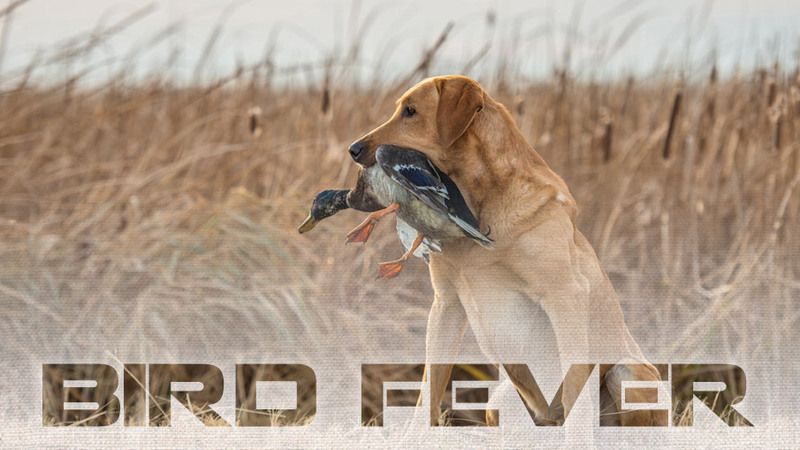 The Revolution and ‘Bird Fever’ is presented by Outdoor Channel, Sportsman Channel, World Fishing Network and MyOutdoorTV. A large fall flight is expected with strong duck and goose populations this year. This has waterfowlers across the country pointing their eyes to the sky, anxiously awaiting north winds, frigid temps and thus the arrival of “new ducks”. Chad Belding of The Fowl Life joins The Revolution this week with tips to make the most of every hunt. Chad says that location is everything and above all, you have to be where the birds are in order to be successful. He’ll discuss concealment and says that while many hunters like cloudy stormy days, he prefers cold sunny days instead. Chad will explain why when the sun is bright and the wind is up, your concealment doesn’t have to be as perfect to pull in ducks as it does on a cloudy day. He’ll also discuss calling and says there is a big difference between blowing a duck call and operating a duck call. He encourages rookie duck hunters to focus on becoming a proficient caller – learning control, cadences and timing. Chad says that calling is a lot about a hunter’s ability to read and react to a duck’s body language, as well as understand that ducks are going to want to hear different things on different days. Tune in for great tips in this special two-part interview with Chad Belding of The Fowl Life on Outdoor Channel. Upland bird seasons are kicking off across the country and Jared Wiklund, Pheasant Forever’s Public Relations Manager, is stopping by The Revolution this week to talk about populations and the future of upland birds. Jared will break down some great opportunities in the Midwest for both pheasant and quail hunting, as well as talk about some of the challenges other states are facing. Jared says time between the spring season and summer and the amount of moisture during that time is a major consideration for populations. He’ll explain why drought conditions are especially tough on upland birds as the lack of moisture presents a lack of insects for birds to eat. He’ll also discuss the vital role that CRP plays in upland game habitat and health. Jared says that hunters need to be watching the 2018 Farm Bill and making calls to their congressional leaders in support of a strong CRP program as that land plays a vital role in wildlife habitat for all species. For a more in-depth look at the state of upland game hunting this season, check out the complete Pheasants Forever hunting forecast here and tune in to hear more from Jared Wiklund. The team at Rainin’ Skies Waterfowl in Denver, Colorado are racing to the finish line getting decoys prepared, putting pits in the ground, and building blinds, all in anticipation of the next few months of extreme waterfowl action. From now until March, those blinds and pits will be a home away from home for dedicated waterfowlers and their dogs. John Gechter with Rainin’ Skies Waterfowl joins Jim and Trav this week to talk goose hunting strategies. John tells Jim and Trav that the importance of scouting cannot be downplayed and that diligent waterfowlers will want to get out and find where the birds are and use that information when building their spread. John says they scout about 4 hours a day and it’s the key to getting under the birds. For those hunters who are a bit rusty, John says that a little bit of time at a local trap range could be very beneficial before heading out to the field. He says that while many have a tendency to rush and flock shoot, hunters really need to focus on one bird and make that first shot count. If you want to find out more about Rainin’ Skies Waterfowl and possibly setting up a hunt with these passionate waterfowlers, check them out here and shoot them a message!